Halifax Harbour Bridges (HHB) is proud to give back to the communities it serves. We are part of the Natal Day tradition in the Halifax region by hosting MACPASS Miles, a one-mile race across the road deck of the Macdonald Bridge. 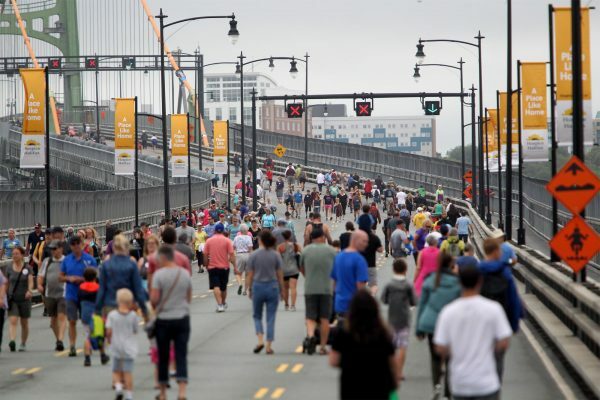 Bridgewalk has also been a Natal Day weekend tradition for more than 30 years. HHB closes the Macdonald Bridge to vehicle traffic from 2pm – 4pm on the Sunday of Natal Day weekend so residents and visitors can stroll the one-mile length of roadway and enjoy some family fun. There is always lots of music and entertainment for the entire family and everything is free! This program is a great way for a charitable organization to promote an upcoming event or simply to help raise the profile of the organization. HHB provides the space to book 12 banners (six on either side) on the Dartmouth side of the Macdonald Bridge. HHB puts the banners up and takes them down – the organization is responsible for producing the banners. Besides the cost of producing the banners there is no cost for the program. To request the banners or floral beds please e-mail bridges@hdbc.ns.ca. We install two rock logo beds a year on the Halifax side of the MacKay Bridge – from June until sometime in the fall or later. We install them free of charge to the organization – we just require that the organization have their logo designed for the site so it’s relatively easy to create it with rocks. Our student landscape crew do the installation and maintenance.